President drums up support for NRMs Nsambu, clarifyies Kabaka abuse claims President Yoweri Museveni has said claims that NRM flag bearer in the Bukoto South parliamentary race Alintuma Nsambu insulted the Kabaka of Buganda and that he is the one who influenced the closure of CBS radio station were lies crafted by people who hate the Kingdom and only what to drag it into trouble. “If Nsambu abused the Kabaka why didn’t Mengo report to me as a leader of NRM. I asked him what he said and he explained that he was blaming the people who wanted to confuse the Kabaka that the Baganda should refuse to work with government which they described as that of Banyankole with long noses. They wanted people to think that it was the Kabaka who sent them. Am a fighter, and fighters don’t know tribes. 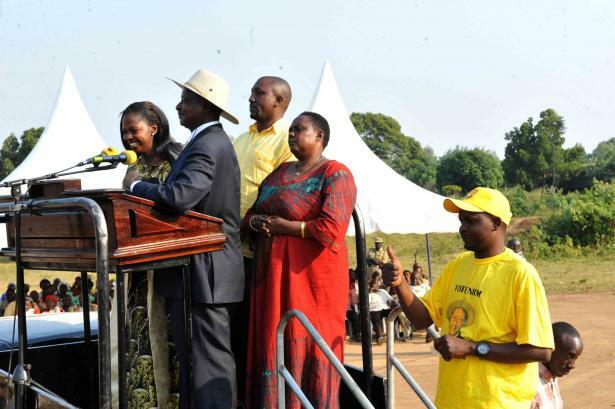 NRM is a tribe for all the people who support unity, peace and development in the country” he said. The President also said that it was the government which closed CBS radio over its use to instigate violence during the Kayunga debacle. “For the Kabaka to return to Uganda, it was because of the blood of NRM. DP was here, UPC which removed him was here etc. If he abused the Kabaka why didn’t they report him to me to discipline them. Those who use the Kabaka for campaigns are wrong because the Kabaka has no sides. They are greedy and only care about themselves.,” he said. The President was today campaigning for the NRM flag bearer in the Bukoto South by elections Alintuma Nsambu during marathon rallies in the district. The President started with a meeting off thousands of NRM chairmen from over 126 villages in the district at Sseke secondary School in kiingo village, Kinoni, Lwengo district. He later held another rally at Kiwangala before crowning it with a mega rally at Kinoni. The President also urged the people to ignore claims that Nsambu is not born in Bukoto South despite having a home there, adding that any leader who vies for parliament should be able to support government development programme on the floor of parliament, monitor programmes and funds sent to the districts from the central government, advocate for development for their constituencies and also market Uganda by promoting tourism and attracting investors. He said people like Mpuuga who mobilize people for street demonstrations instead of development are only dreaming. “Mpuuga is dreaming if he thinks that when he demonstrates on the streets, he will remove government. A street demonstration to remove the NRM government which is elected by the people…that is why we use tear gas to disperse them so that they don’t destroy peoples businesses,” he said. The president also faulted some NRM leaders who have been working against their own party saying that it is like scoring an own goal. “As you know in football there are two sides, just like in politics. There is our party and the opposition. In football when you touch a ball and the ref sees you he blows the whistle, but if he has not seen anything, that can pass. In the NRM it is our own people who inform the ref that their member has touched the ball,” he said. The President was reacting to reports that the woman member of Parliament Nakabira and MP Sejooba were rejected by supporters and forced away from a rally for decampaing the NRM candidate Nsambu. “The divisions among the movement made us loose elections in Luwero, Jinja and Bushenyi. It was not the opposition but our own people with their wars. I urge you not to make the same mistakes,” he said. The President also said that the NRM majority led appointments committee is the one that rejected former MP Mbabali for lack of academic qualifications, adding that the committee did a job that was meant for a different institution by focusing on the academic qualifications. The President called for quality service and unity among the leaders to their people adding that government is fast tracking development including construction of roads and electricity. Bukoto South by-elections have attracted seven candidates including NRMs Alintuma Nsambu, Mathias Nsubuga (DP) and Julius Ssentamu (FDC) among others. The by-elections are set for July 12, 2012. The fell vacant after Muyanja Mbabaali was thrown out of Parliament.